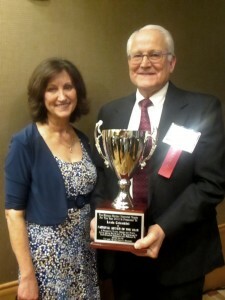 Louie Colombini Named “National Cotton Ginner of the Year”! Louie Colombini, Westside Farmers Co-op Gin was named the winner of the 2015 Horace Hayden National Cotton Ginner of the Year by the National Cotton Ginners Association, this month at the National Cotton Council Annual Meeting in Dallas, Texas. Louie is one of the most active Ginners in California Cotton Ginners Association. He is a past Chairman of this Association in 2000-2001, Ginner of the Year recipient in 2002, and longtime and current board member. Currently, Louie sits on the Association’s Joint Steering, Safety, and Energy Committees. Additionally, Louie has served as a board member for the San Joaquin Valley Cotton Board. Finally, on the national level, Louie has been a longtime Ginner delegate to the National Cotton Council. Louie is a member of, and serve as a Eucharistic Minister for the St. Phillip’s Catholic Church. He is a past Grand Knight of the Knights of Columbus. Louie was also involved in the Boy Scouts for 15 years. Louie has been a significant contributor to the California cotton ginning industry for many years, and is a shining example of the leadership within our industry. Congratulations to Louie Colombini! This entry was posted in NEWS & ISSUES on February 9, 2016 by ccgga.